Previously, I made a negative review of Zest Air. I said that Zest Air is quite dangerous and have a high rate of mishaps. Now, I am thinking twice about that. I believe that Zest Air responded to such criticisms and they fixed their image. Of all the local airlines that I canvassed on, I believe that Zest Air offers the cheapest fares. Their regular fares are slightly lower that the ones offered by Cebu Pacific, and that is if the taxes and other fees are already included. Aside from that, Zest Air also offers promo fares. Just like in getting Cebu Pacific promo fares, the competition in getting Zest Air promo fares is stiff. Thus, it is advantageous for you if you will get information on Zest Air promo fares the moment they are posted on Zest Air website. 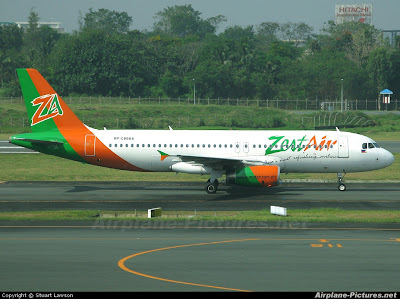 To get timely updates on Zest Air promo fares, you must follow Zest Air on Twitter and Facebook. When I am booking for my Davao trip, I noticed that the fare price of the flight that I plan to book increases as days pass by. Therefore, I suggest that you book your flight the moment that you see the promo fare. Decide quickly in buying Zest Air promo fares so that you can book cheaply. 3. Pay using your credit card. When you book online for Zest Air promo fares, you can only pay using credit cards. Even if you just book online for none promo fare, the only available payment option is through credit card. So, you must prepare your credit card when availing Zest Air promo fares. According to Zest Air website, if you don't have your own credit card, you can use other person's credit card. However, you need to bring the photocopy of the credit card that you used because it will be checked before you board the plane. 4. Call the ticketing office to reserve a flight. I am not sure if this is true, but I asked a clerk in the Cubao ticketing office of Zest Air on how I can reserve a flight for Zest Air. She said that I can call their ticketing office so that they can reserve the flight that I want. I have to try this in the future though before I can be sure if what the clerk is saying is true. I will fly Zest Air this month and that flight will be the best opportunity to experience flying with them. Zest Air has very low fares. I hope that the quality of their service is not as low. Read related posts which are about how to avail PAL promo fares and Cebu Pacific promo fares. Naku. Wala namang pinagkaiba yung pagsakay sa eroplano sa pagsakay sa bus, lalo na kung Economy Flight lang sinakyan mo. Tapos pagtingin mo sa bintana, imbes na sidewalk makikita mo, ang makikita mo ay ulap. tama si anynomous.. Sarrap talaga mag ride sa airplane..hindi mo alam kung ano pakiramdam sa ere.. Well, yung mga bahay parang langgam sa liit,hihi! Well, nag-pray naman kami bago lumipad yung plane kapag sumasakay kami ng eroplano. wala ba talagang flight ang zest air ng GEN SAN.? wala ba talagang flight ang Zest Air ng papuntang GEN SAN.? Wala pong GenSan sa Zest Air. Wala po kasi sa listahan yung general Santos City sa Zest Air website.